Take a well deserved break in our scenic thermal wonderland, with a cruise aboard our boat, the MV Waiora; suitable for up to 48 passengers. Spend a leisurely day relaxing on board, swimming in the tranquil waters or learning the art of rainbow trout fishing. Lakes Lodge Okataina lake cruises offer various options including on-board drinks and nibbles, barbeques and fishing options. Lakes Lodge Okataina can provide all your fishing gear, licences (charges apply) and a knowledgeable guide. Fishing Licences are available from our Rotorua lodge at current licence prices. View/download our Fishing Venue Flyer. View/download our Lake Charters Flyer. 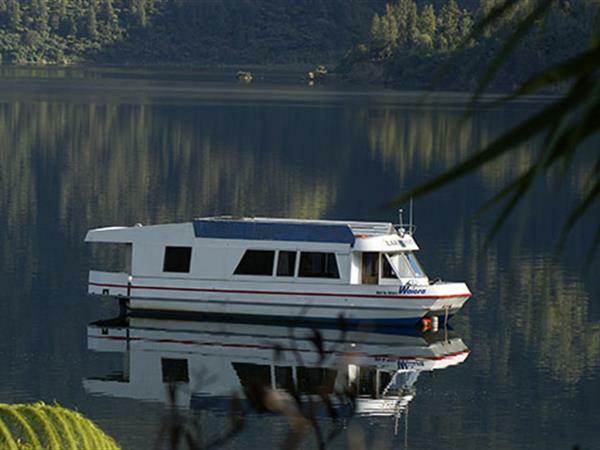 Please enquire about rates for our chartered cruises on the MV Waiora. Click here to contact us now for rates.